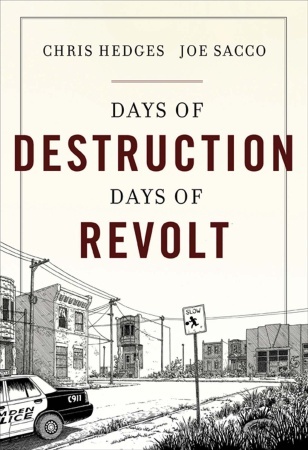 Chris Hedges joins us to discuss his latest book, Days of Destruction, Days of Revolt. Together with comic artist Joe Sacco, Hedges traveled to the most economically depressed areas of America to document the effects of the global recession on a personal scale. Although I would classify myself as a conservative Republican and not as a liberal, I was deeply cheered to hear Mr. Hedges comments today on your show. I am looking forward to buying his book. I long for the days when the good government wings of both the Democrat and Republican parties will join forces to bring good government to all and especially to the disadvantaged among us who need it the most. I would love to stop ranting to my family and friends (and I’m sure they would love it as well) about how government hates poor people … too many people who we elect to spend our money … use poor people as a commodity to enrich their political supporters. The terrible irony is that the Presidential election in November 2012 is basically between 2 very similar political mindsets … Romney and Obama have both built their political careers with very aggressive “pay to play” politics …using laws and their political positions to benefit supporters and punish political opponents. The common good is not supported with these tactics. Middle class and upper middle class Americans can compensate for bad government and have the money to work around it, but poorer American citizens really take it on the chin.